To know how extraordinarily powerful a thing fire is you only need to observe that you can light a fire in Sapa in winter, that if you put too long a piece of wood on the fire it is conceivable that, after you are asleep, the nearer end of this piece will come out of the fireplace and set fire to the hotel and that you need to keep the curtains away from the fireplace, and do the same with the ethnic-minority, back-borne basket in which the wood is delivered to the room. The buildings in Sapa could in general be described as multi-storey concrete tropical. It is as if the lowland, rice-growing Vietnamese have used their box architecture for the highlands as well. To wake to the news that such-and-such a hotel had burnt down would be improbable. But then the existence of the flint-lock rifle in history shows that you can get fire out of stone. In passing, let’s mention the imagined slight smell of fired flint you may get in a minibus on the hour-long drive to Sapa from Lao Cai. This is due to the pieces of rock that have fallen on the road from the mountains. It may seem that your very vehicle could be hit, but this, while it has happened, is a statistically negligible risk just the right size for the adventure of Sapa in winter. 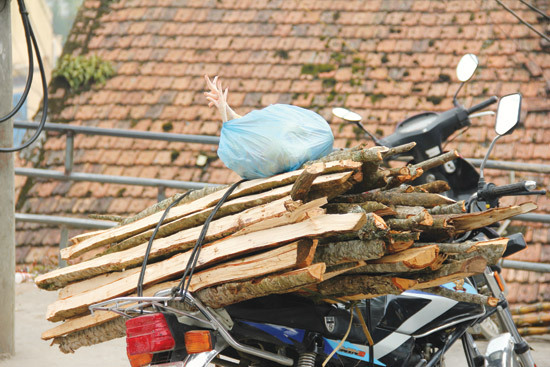 At any hour of the day you will see the importance of fire to Sapa in the ethnic-minority people who carry more than their body’s weight of wood upright in their basket. It had snowed at Sapa a week before we were there – our stay was Christmas 2013 to New Year – and when we wondered to a ranger at the stooks of firewood behind a Sapa peak, the wood was, likely story, like a windfall of apples, a snowfall of broken branches. Wood is so scarce that even at zero degrees centigrade outside and much the same inside, a cafe, bar or restaurant is not necessarily going to light a fire in the hearth. The hearth looks at you without heart, saying, depending our your mood, you are not worth a fire, that what you wear outside will be needed inside as well, that is, top to bottom, a beanie or balaclava or both, two or three scarves, a singlet, shirt, two jumpers and an overcoat, long johns, trousers, two pairs of socks and a pair of boots with thick soles. If you are lucky you have brought a woollen singlet from Australia or, as a man from Belgium put it, pulling up his trouser leg, ‘merino’ long johns. Even ye olde hot chestnuts, reminiscent of Charles Dickens and the Phantom Raspberry Blower of Old London Town, I saw heated not on a brazier but in an electric grill. Before we went to Sapa in winter, this extreme sport, not like simply going to Sapa, but like climbing the local mountaineering challenge Fansipan in summer, numerous Vietnamese friends and relations told us not to go. Because they did not know of, let alone know the word for, central heating, the only reason they gave was that the temperature would hang around zero centigrade in mist that lasted till 4.30 p.m. Because they did not give a cogent reason, I just thought, ‘Oh, they’re lowland, wet-paddy people who think snow comes out of a pressure pack.’ The most eloquent of these Vietnamese said we were being . . here they gave a Vietnamese phrase my Vietnamese wife tried to explain: ‘It is like thrashing your own body.’ I dare say the precise translation was ‘masochism’. Of course, to enjoy the biathlon that is Sapa in winter you need to take it as a bath of beating with Scandinavian birch twigs, imagine these are in plentiful supply and imagine they are more the weight of snow-laden branches. Some people have a natural handicap for this biathlon, which is a test not of cross-country skiing and rifle but of the two states sleeping and waking. The usual way to get to Lao Cai is by sleeper train from Hanoi. I had previously been led to a hospital in Hanoi after spending 30 or more hours on a train from Saigon. I returned to Saigon by plane, which is not allowed in this kind of contest. Whether a compartment on a Vietnamese train is far too hot or far too cold depends on the compartment, the date, time of departure, the destination and the personality and emotional state of the traveller. The best advice is to take a roll of unusually tenacious adhesive tape and hang a regulation rectangular Vietnamese rain cape between yourself and the air-conditioning vent. This in addition to the basic balaclava with beanie over that. They supplied an eiderdown in which it was not likely the down was from the eider, a northern sea duck, but was most satisfactory as far as it reached. This time I was euphoric and careless, on the lap from Hanoi to Lao Cai. When shortly challenged to descend and reascend a valley via an ethnic-minority village I became more or less lodged in the seat of the valley and had to claim ‘altitude sickness’. Some people say the altitude is only 1,500 metres, however. As I pretended not to be affected, in coming up the valley’s side, I received a telephone call from a slight, mountaineering companion looking down and telling me I had taken the wrong turn. Trying every theory, including age, I eventually diagnosed a chill caught on the train, which had allowed the entry of a nasty bacterium to the walls of my intestine. My wife obtained some ciprofloxacin under a Canadian brand. ‘It is made in Canada,’ she said with delight. On closer examination of the box it was made in Vietnam. By this time it was nearly on to the minibus for return to Lao Cai. But we had not missed anything of the Olympian enterprise Sapa in winter. And to show you how good it is a middle-aged Russian woman in our loose group of four decided she would settle there not like the infrequent snow but for the rest of her life. When we first arrived and got out of the minibus and stood among other hotel guests in a lobby whose uninsulated walls sucked calories so strongly that they had no need to stub their cigarettes in a dish of wistfully regarded beach sand, they looked at us in shock. Many of them we didn’t see again. 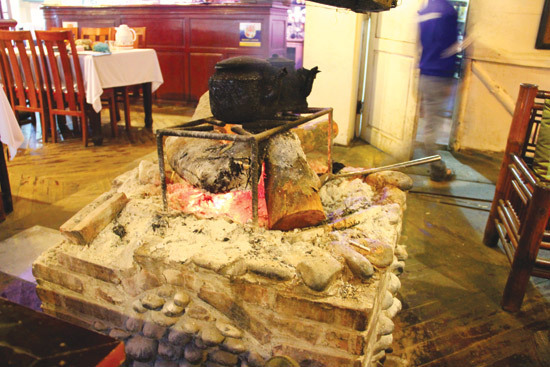 The friend who had been there seven times before and challenged us to Sapa in winter normally was a balanced chatter on the Internet and it seemed inexplicable when she kept saying, with capitals, that we needed to book a room with a ‘FIREPLACE’. Her message was so powerful that when I phoned the hotel I said, ‘I would like to book a double fireplace.’ The mouth of the fireplace we got was not much more than half-a-metre wide. I come from the Snowy Mountains (it is a big country) of Australia and a house where there was no such thing as a fireplace smiling under a metre-and-a-half and there was one of these in each of every inhabited room. The wood pile, as high as the roof and as wide as high, was created by a mighty disc saw like a reflective lake driven by a belt from a tractor. That in Sapa we got by on only two or three baskets of wood a day (a few dollars extra for more than one a day) was due to our intelligent use of the electric blanket. I asked my Russian host whether we could buy a battery to run the blanket and wear it over our shoulders as we found our way through the fog. 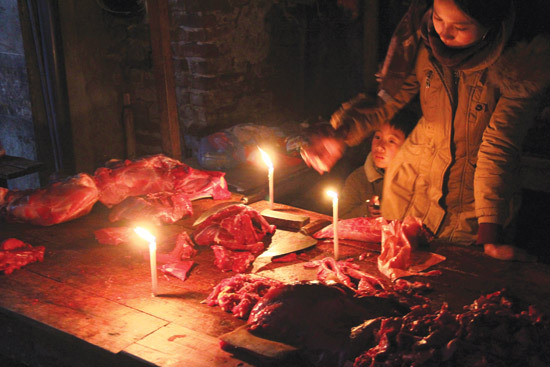 There are blackouts in Sapa, as anywhere, and candles were lit in the market and where wild pork was advertised by a strip of white lard with black hairs streaming out of it, seeming to stand somewhat on end. What if there is both a blackout and no basket of wood? A blackout did happen, and, asking at reception for an extra basket, we held our breaths. My wife complained about this stopping of steam from my mouth on her cheek. There would be the extra basket, however. If there had not been, then I did hear there were commercial baths in Sapa, which would be, I think, of the Turkish, not Scandinavian, persuasion. Not forgetting this is a sport, I had to learn to work out where toilets were and employ the words politely to wangle use of them. I saw a cafe at the top of a ladder going up an earth bank. ‘Can I use your toilet,’ I asked. ‘There is no toilet,’ a young woman said. ‘I will pay you one hundred thousand dongs to use your toilet,’ I said. She showed me the toilet. I used it. I dropped ten thousand dongs through the window of her scullery and descended the ladder. ‘That is not a hundred thousand,’ she said.’ ‘Ten thousand is plenty,’ I said. In biathlon terms, I had not failed to take a corner and soiled my trousers on colourful heather, which would have required a return to the hotel. It is only when you arrive deeply in northern Vietnam that you appreciate their enlightening form of truth. Language for them is about what you can achieve with it, not about language with a life and meaning of its own. It is not the dragon that the speaker is. In fact, conversations are one of two groups of artefacts that charm most in Sapa, the other being ethnic-minority handcrafts. About a bowl of noodle soup, I said, ‘This does not appear to be thinly-sliced beef.’ ‘No. It is pork but it is very good.’ About a snack: ‘This was not warm goat cheese. It was blue cheese, probably from Auvergne.’ ‘The chef is French.’ ‘May I speak to the chef?’ ‘The chef is not here.’ He was also not noticeably French, when he phoned me, as they had kindly asked him to do. It is your aim in Sapa in winter, however, to land at the fireside of any attractive venue without shooting a wood porter instead of a buffalo-silhouette target on a crest or drowning in their famous ‘silver’ waterfall. In fact, the owner of our own hotel was the one in front of the fire at the establishment of the menu written in French (possibly before the Battle of Dien Bien Phu, in 1954) when we got there. We were runners up at this hearth but by the use of patience we moved into first position when our hotelier left. He also frequented a hot spring, or heated pool, at the EFM (establishment with French menu). If you cannot find a moose head on a wall in Sapa you are guaranteed to find a buffalo’s for sale in the street. The lowland Vietnamese in the northern highlands sell things, and these things are more and more made in China, which is not far to the north. On silk, they say, ‘Oh, Vietnam has many kinds of silk, and the kind from silkworms is only one of them, which we don’t have.’ On wool, they say, ‘You are talking about the kind of wool that comes from sheep. That would be far too expensive.’ This, despite that Vietnam has plenty of woolly sheep at Phan Rang. It is not as if the extra dollars would go astray. I tried on some of their so-called ‘woollen’ balaclavas and pom-pom hats and beanies. I almost got an adjunct chill from the repeated applications of cold compresses that these tryings on constituted. I found that darker colours sucked calories more than lighter. I decided to stick with a white hat my wife had packed and never put it on without sleeping on it first or warming it by the fireplace. My hat had a flower appliquéd to it, so that I heard women half my age in a Lao Cai cafe agree between them I looked ‘cute’. This is part of what you get on the Sapa biathlon. The ethnic-minority people make as well as sell things. I obtained a collage of Black H’mong collar embroideries for a wall hanging or table mat. These embroideries will never be made again once the old stitchers die out. I obtained a hemp scarf not yet dyed, so that my neck would not take the green or blue of indigo seen on ethnic-minority fingers. The hemp is spun by hand the length of a woman’s day as she goes round doing other things. While the ethnic-minority people survive in clothes made from mountain plants, we outsiders probably need ones made from animals or least derived from Vung Tau petroleum. Should you not be from Vladivostok, of a certain age and caught this side of the Urals with nothing to lose, not have evolved the ability of a reverse fire-walker and go barefoot below zero (as many ethnic-minority people do), or not know how to live in a wooden-slab hut picturesque in peak and mist, then Sapa in winter is a surefire (fingers as well as kindling sticks crossed about the ‘-fire’) adventure. I cite a young Latvian woman in our train compartment, travelling on her own, who was going to home-stay in an ethnic-minority village. The adventure holiday is equal in attraction to the mollycoddling one in temperate lounges with well-meaning buffets. It has the lasting frisson of survival. The adventure Sapa in winter is realised most essentially when, though despite the relatively high temperature of zero centigrade, your fire seems, when you first crouch before it, like one of those used to create ‘cosiness’ at Ho Chi Minh City barbecues, comprising plastic logs, an electric light, pinkish-red, genuine, silk-worm silk tongues and a fan underneath to make the them lick ravenously. After five or ten minutes, given your degree of faith and the exceptionally combustible firewood supplied, radiation begins. Part of what makes for the adventure Sapa in winter is turning up not fully prepared. This adventure is not about necessarily bringing icepicks and crampons on the train but bargaining for surprisingly, dubiously, labelled Gore-Tex and North Face items, and long johns, in the Sapa shops. The thing to avoid at all costs is sitting or lying in one place and just relying on clothes, no matter how many you have stuffed into a 20-kilogram case. A successful contender at the biathlon of Sapa in winter is one who does not end up like either one of the less hardy buffaloes that died in the recent snow or the man who slides like a coffin-shaped ice block from the dogsled that crashes in the classic Alaska film White Fang. Take it as a caution if this film is shown on the TV beside the fire in your room, as it was in ours.